Half an hour before “show time”, the anxiety mounted on two fronts: is the Powerpoint projector going to be found and will it be compatible with our laptop? And, as usual, how good was the publicity and how many people would attend? Good news: The projector was located. It wasn’t compatible but Dr. Timo Werner, Professor of Political Science at Koblenz University in Landau and CEO of the Frank Loeb’sches Institute , brought in a laptop that worked. What did Rudi’s father do? And people started arriving and arriving until the room was just about full. After our standard presentation, audience members started right in: Was Der Alte, Rudi’s father, guilty in the death of his brother at the hands of the Gestapo? Could he have saved him? It’s a haunting question with no answer and we’ve been asked it frequently. We deliberately left the issue open in our novel Der Stolperstein because we don’t know the answer. What we do know is that Rudi’s father was promoted and grew more powerful during the years of Gerhard’s imprisonment and eventual death – and afterwards. What about Sippenhaft – kin liability? A new intriguing question was asked about Sippenhaft, a Germanic concept which predated the Nazis. 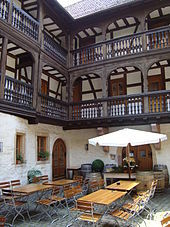 In traditional Germanic law, Sippenhaft accepted the idea that the clan of a criminal was liable for offenses committed by one of its members. In Nazi Germany, the term was revived to justify the punishment of kin (relatives, spouse) for the offense of a family member. In this form of Sippenhaft the relatives of persons accused of crimes against the state were held to share the responsibility for those crimes and were subject to arrest and sometimes execution. As implemented by the Nazis, the concept enabled the state to round up pretty much anyone they wanted and murder them without a trial. Apparently Sippenhaft didn’t apply to Gerhard’s family – his brother the high ranking Nazi and his father, the local police inspector. Why not? It may be that the interest we are encountering on the book tour about who is to blame for Gerhard’s fate is related to guilt. Not just about what Rudi’s father knew and why he failed to act but what the German people knew and why they didn’t speak up. Certainly it’s an issue that many German families seemed to be grappling with even now. On the more mundane side of our trip, amidst the many stories we hear and feedback we get, we continue to worry about whether we’ll have enough books. Here in Landau, we had only seven left. We sold them all. Rudi’s nephew will be meeting us at our next stop in Dortmund and bringing us a supply we had shipped to him. We had no idea there would be such a demand for the books every place we went. What a nice problem! 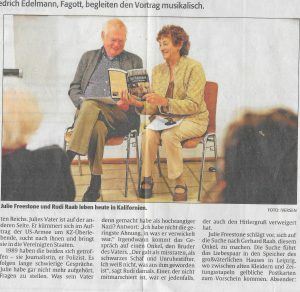 Rudi Raab and Julie Freestone were touring Germany with their novel Der Stolperstein. This blog was written after the event in Landau but inadvertently not published. One advantage of the delay is that the article DIE RHEINPFALZ May 19th 2018 003 published after the event can be included here.